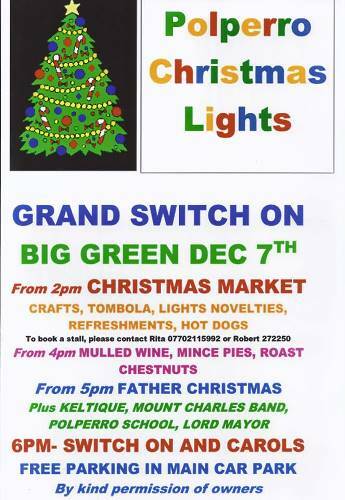 Tired of shopping and the pre-Christmas rush? 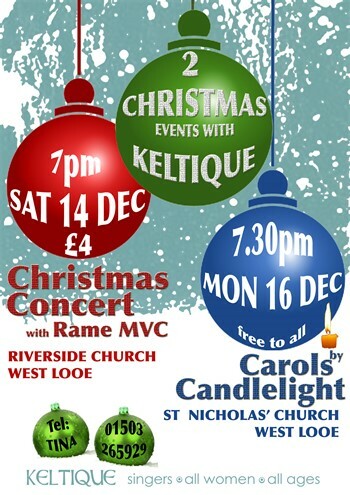 Then come in from the cold on Saturday 14 December to enjoy a wonderful evening of traditional Christmas music, song and carols with Keltique and the fabulous Rame Male Voice Choir – a seasonal celebration to lift the spirits, warm the soul and celebrate the festive season at Riverside Church in West Looe, starting at 7 pm, tickets a mere £4 from Tina 01503 265929. 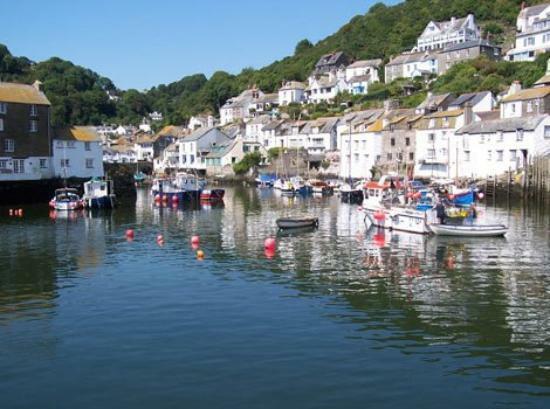 And then on Monday 16 December, get into the festive spirit and come and sing carols, old and new, in the beautiful and intimate surroundings of St Nicholas’ Church on the quay at West Looe – Carols by Candlelight with Keltique – starting at 7.30 pm, free to all! What A Bit Of A Do! 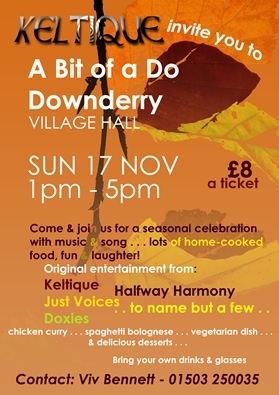 Warming up for the festive season at Downderry, the village hall was packed as we tucked into a beautiful lunch, a libation or two (just how much beer is in that crate, Dave?) 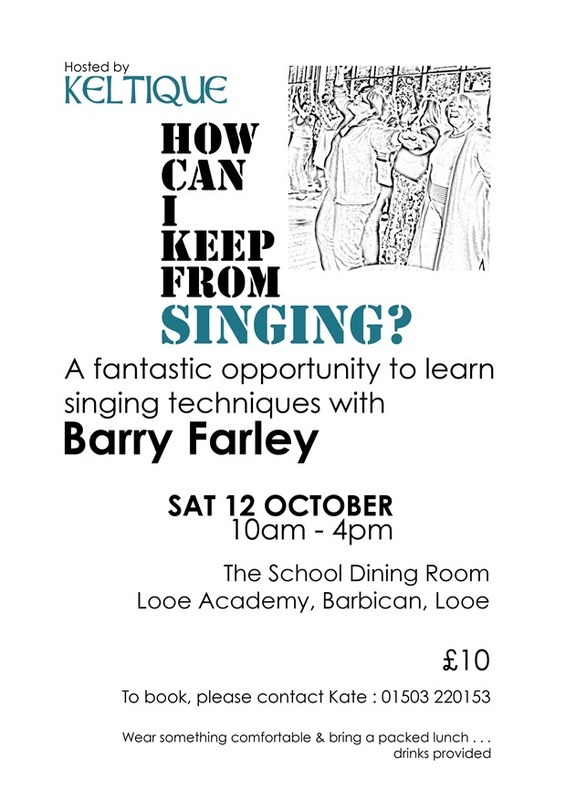 and then a feast of song, music and fun to round off a day by the seaside. It was lovely to see old friends and meet new ones, including those who wandered in from their Sunday morning constitutional to see what was going on – many thanks again to everyone involved, Jonathan Delbridge, Liz Sidebotham, Doxies, Just Voices, our Fabulous Fairy, Halfway Harmony and Keltique, and most of all our very own Viv, without whom none of this would have happened! 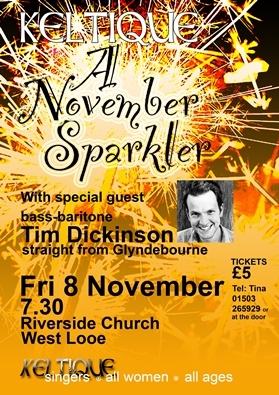 So disappointing that Tim D had to return to Glyndebourne yesterday at short notice but everyone understood and so it was left to Keltique, Liz on the piano and accordion, Jonathan on the organ and Just Voices to sparkle away at our November Sparkler evening yesterday down by the Riverside in Looe – and not forgetting our lovely audience and their two part harmonies on Oh Happy Day, truly impressive. So well done everyone, we’ll keep our fingers crossed Tim D can join us another time, and the Keltique bandwagon rolls on to Christmas. 11 o’clock on a Sunday morning in the driving wind and rain, what would you normally be doing? I know Keltique are a fairly mad lot but there we were at the Trewithen stage in Looe, singing up a storm by the riverside, and so were a lovely audience, probably equally mad. We had a great time, thanks to all who came along, as ever to Jonathan and Liz and special mentions to Maggie and Steph, we’ve missed you! 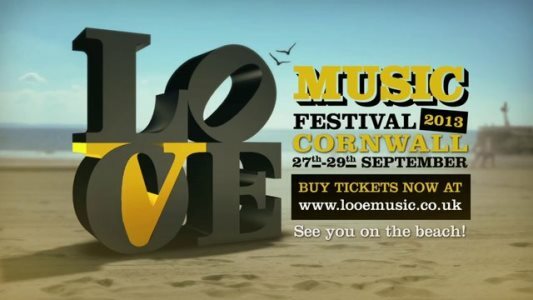 Such a busy month, all culminating in the Looe Music Festival over the 27-29 September weekend. After Keltique’s debut at the festival last year, we’ve been asked back so must be doing something right! 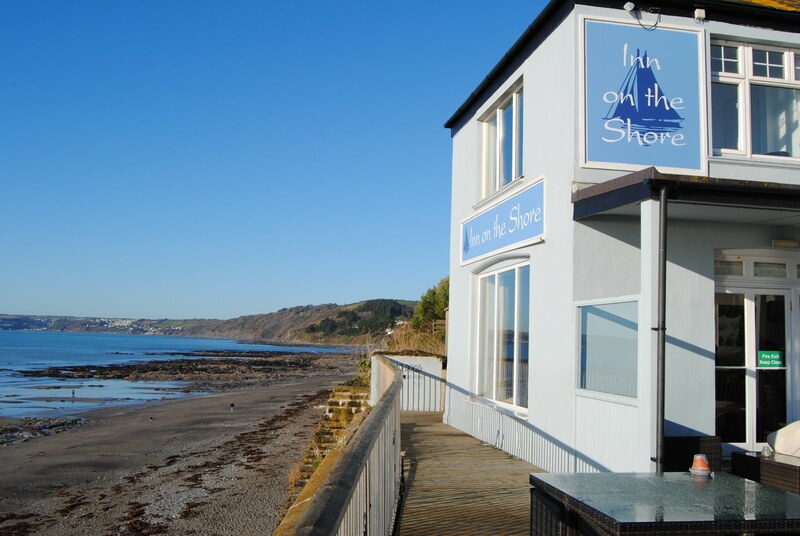 This time we’re at the Quayside stage in West Looe on Sunday 29 September at 11 am so if you find yourself strolling around Looe bright and early on Sunday morning looking for something to do, come and see us singing down by the riverside. What a great night with the wonderful Loveny Male Voice Choir last night – lifting the roof off at Liskeard Methodist Church with quite stunning performances all round, everyone made a fantastic sound and it all built up to an amazing finale! Many thanks to Loveny for such a special evening and really hope to join you again for a return gig . . . meanwhile all our very best wishes for your big night at the Albert Hall! 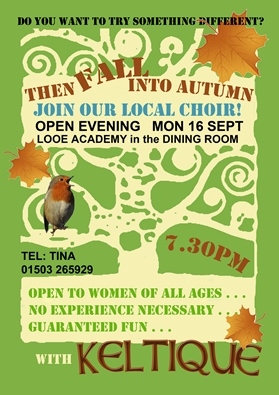 Our next Open Evening is on Monday 16 September from 7.30 pm at Looe Community Academy, in the Dining Room – do come and see us, listen, join in, no experience necessary, girls just want to have fun! 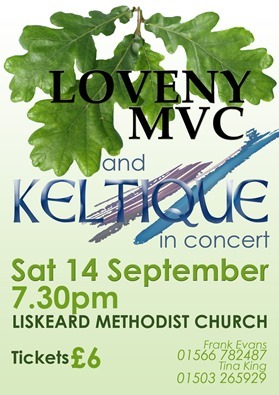 New poster for Loveny MVC and Keltique joint concert at Liskeard Methodist Church on Saturday 14 September at 7.30 pm . 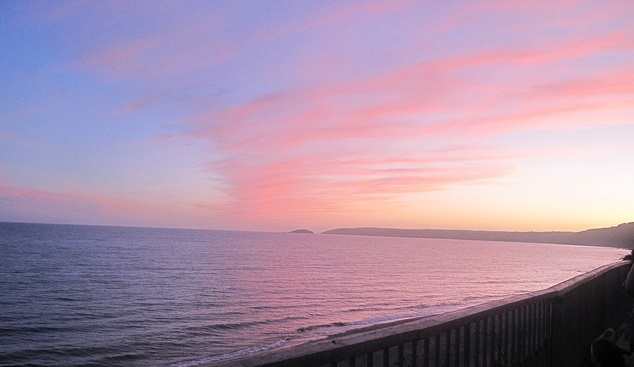 . .
Beautiful singing and a rosy pink sunset beside the sea in Downderry yesterday made for such a special evening, it was an incredible setting and we all had a great time so many thanks to the Inn on the Shore for inviting us. And even more thanks to all who sang – Keltique, Just Voices and Doxies – to Jonathan our MD and Liz our accompanist and to everyone else who supported us and made the evening possible, we really couldn’t do it without you. A breezy and cool evening at the Polperro Festival but the rain stayed away and Keltique warmed things up with a lively and heartfelt set on the Big Green – well done everyone, particularly Liz and Cynth who struggled to keep the piano music from blowing away, to Jonathan for his outstanding direction, to Viv for whistling on cue and to our new mezzo Megan for her confident debut – and many thanks to everyone at Polperro for their support. We’ll hope to see you all again next year! “What a great evening – when are you going to do another one?” has been the popular response to the first Keltique & Friends concert at the Riverside Church in Looe last Saturday – eleven different acts came to join Keltique on the night and gave us such marvellous performances, so a really big thank you to (deep breath) Terry Gosden, Halfway Harmony, Jackie Haines, Doxies, Lottie Jones, Liz Sidebotham, Viv’n’ Tina, Richard Cowen, Looe’s Women Singers, Helen Casson and Jonathan Delbridge. So much versatility and flair, all that were there were wonderfully entertained. 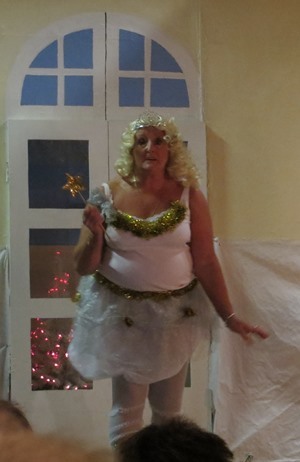 And a special thank you to Halfway Harmony who carried on entertaining us at the afterglow . . . as for the original question: there will definitely be another Keltique & Friends event so be sure to check out our website or follow us on Facebook. 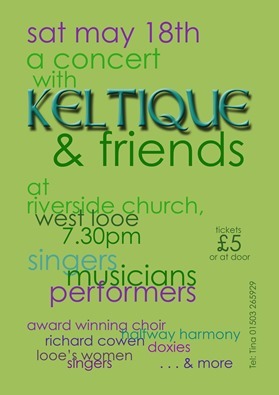 Keltique performed their first concert of the year on Saturday 20 April, at the Riverside Church, airing songs from their new repertoire that were well-received by the audience – including a lovely arrangement of Barcelona by Liz Sidebotham, our accompanist; Bridge over Troubled Water by Simon & Garfunkel and Rule The World by Take That – and our guest folk singer and guitarist, Tricia Moore, gave some most beautiful renditions of her own work. For the first time Keltique were more than 30 strong, of which six new joiners were making their concert debuts. A great start to the 2013 performance programme! At the Saltash Music, Speech and Drama Festival on 1 February, Keltique won their category for the second year running – performing Something Inside So Strong and California Dreaming – scoring 88 out of 100 and improving on last year’s result. Many congratulations to all involved, particularly Jonathan Delbridge, our MD, and Liz Sidebotham, our accompanist.